Always put a good flannel underneath your table cloth. 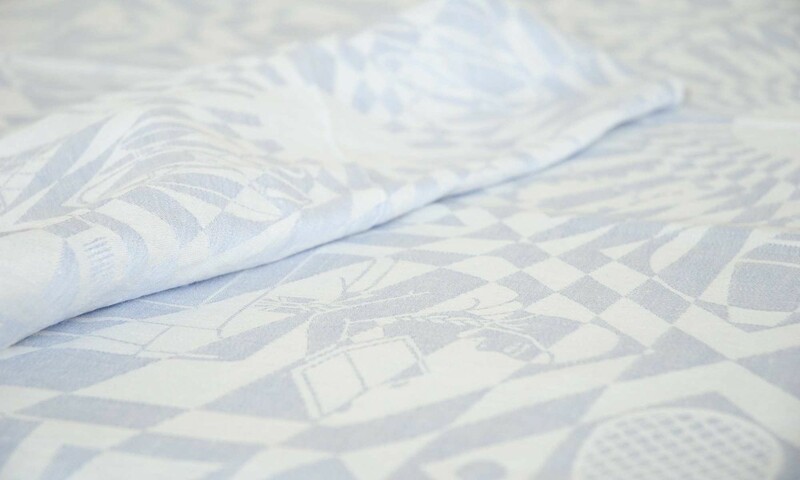 Not only will it protect your table, it will also show up the pattern on your linen damaskwell. An excellent quality of flannel is available from Sanny’s webshop. The upperside is made of cotton, the back is made out of natural rubber, not only to make it anti-slip but to really protect your table as well. It can simply be washed in a washing machine. Table linen damask can be washed in a washing machine at any required temperature (up to 90ºC). Brown stains and marks appear on linen damask when it has not been used for a very long time. The cleaning product Vanish is ideal for getting rid of these stains. Many stains have disappeared after an hour of soaking. Vanish is available from supermarkets. Other old, especially yellowy stains can be dealt with by using bleaching in the old fashioned way. After soaking it for a little while, take out the linen damask and spread it out on a lawn. As soon as it is dry, soak it again for a little while. The stains usually disappear within 1 or 2 days. The bleaching season runs from March to November. Remove small stains after every meal with a moist cloth using a little bit of washing up liquid. Let it dry and see if the small stains have disappeared. Help!!!! A glass of red wine on my table linen!!! Reassure your guests by saying: ‘No problem!’ then go to the kitchen to get a clean cloth, make it wet and use a little bit of washing up liquid. Use the cloth to dab on the stain. 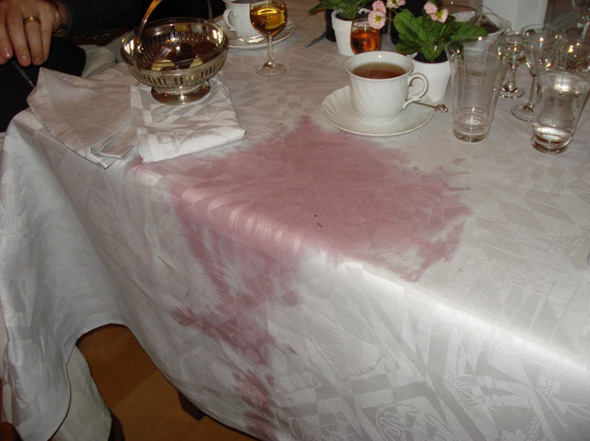 Then make sure you keep the stain wet all through dinner, making sure that the wine stain can’t get through to every fibre of the material. Wash the table linen or continue to keep it wet after the meal. 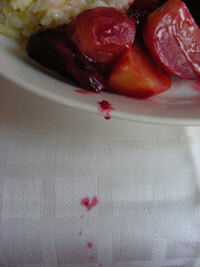 By the way, most stains can be prevented by serving the food on plates. NEVER put pure linen damask in the tumble dryer, because it will become limp and lifeless!!!!!! Fold it as neatly as you can after washing it, put it as a flat package on the washing machine or on top of the tumble dryer and leave it there for a few hours. It will save you more than 50% of the ironing or mangling work. In bygone centuries this was called ‘sticking the linen’. Neatly hang up the linen without using pegs on a hard, round washing line, partly folding the linen, for example a drying rack. NEVER use pegs to hang the linen on a limp washing line, because it is a lot of work to iron out the ugly shape. Linen damask gets a lovely shine when applying the right level of pressure in combination with the appropriate level of moisture. So folding it and hitting it with a wooden hammer gives a lovely result (that is how they used to do it in the 17th century). Use a cold, electric mangle for the best and fastest result. You can buy the electric Swedish mangle with a width of 80 cm from Sanny’s webshop. If you don’t have a mangle, iron your linen when it is still a bit moist, preferably with a steam iron turning it up to cotton or linen.